We are thrilled to be featured in Weekend Notes this month! 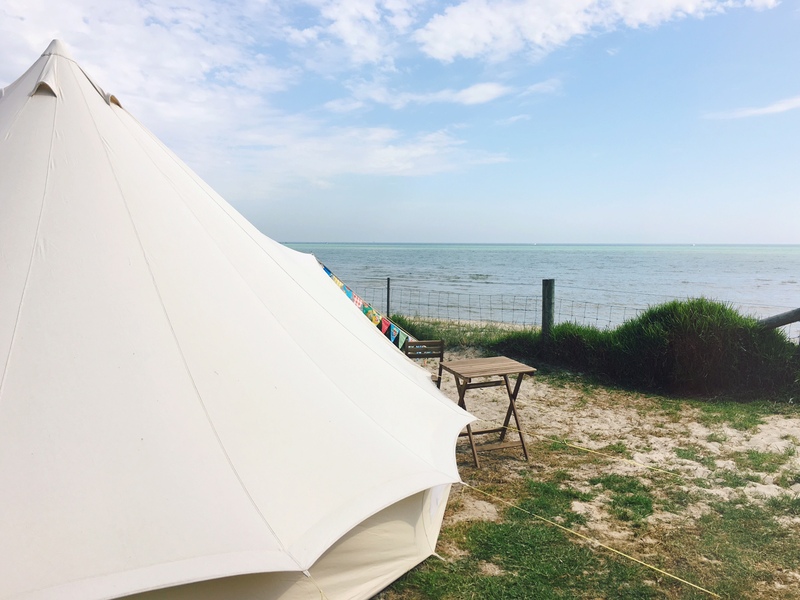 Gwen O’Toole and her partner Megan went happy-glamping on the Capel Sound Foreshore and enjoyed the heat wave right by the beach. Read the Weekend Notes post by clicking here or keep scrolling! If the thought of camping conjures up memories of roughing it in sleeping bags on the cold lumpy ground; boiling in the tent during the day and freezing at night … well, your idea of camping is about to be challenged. Happy Glamper takes the concept of camping and turns it into a ‘not-so-roughing-it’ experience with it’s sizeable bell style tents, comfy mattress and plenty of little creature comforts that’ll have your outing feeling more like a retreat. Ideal for getting away for the long week, or just a few days out of the city, Happy Glamper works in conjunction with a variety of camp grounds in the Mornington Peninsula area. Simply contact Happy Glamper and reserve yourself a tent. If you’re looking for something even more special, they have beautifully renovated retro campers that can be booked out as well! One you’ve secured your tent, you simply book yourself a camping spot at one of the many sites they work with, let the folks at Happy Glamper know your site number and that’s it. Just turn up on the day and they do all the hard work of setting it up for you. 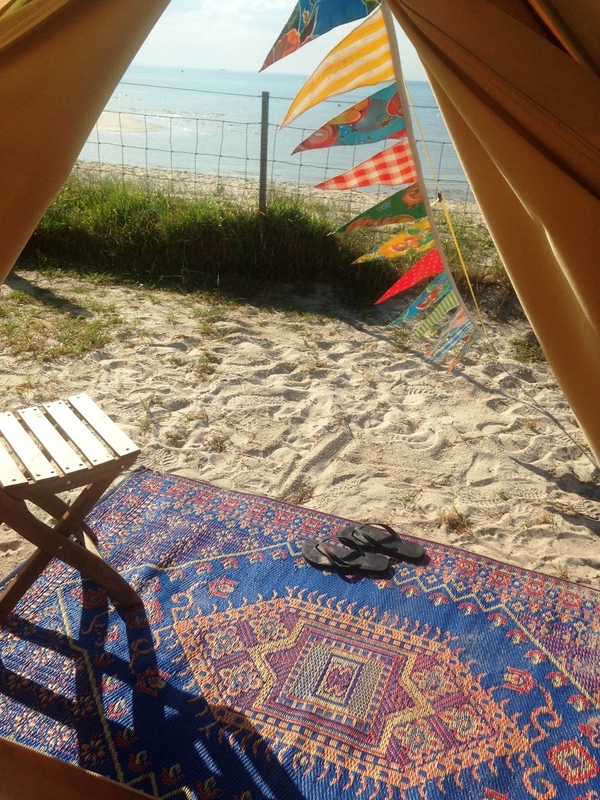 Following the helpful advice of Happy Glamper, we booked our spot beach front (ask for section F) at Capel Sound Foreshore and on the day of our arrival we received a text letting us know our site was all set up and included a code for the lock to the tent door to get inside. 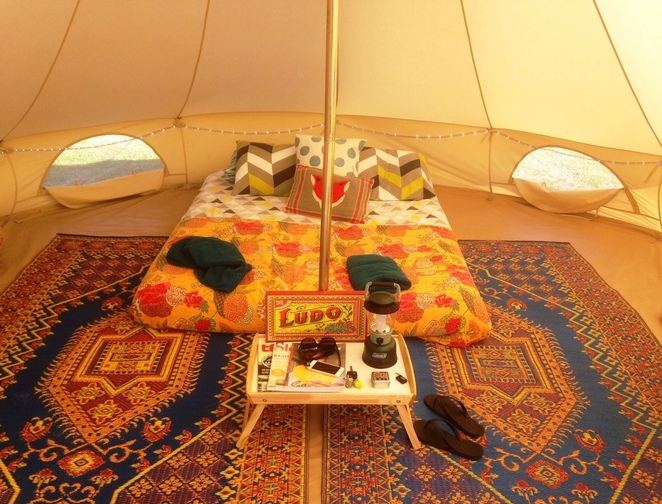 Your glamping tent includes everything you might need for an overnight stay including all your linen, towels, indoor and outdoor mats, a lantern, internal fairy lights and a power point (if you booked a powered site) chairs for outside, as well as a few things to keep you entertained like board games and magazines. If you really want to indulge a bit and not have to worry about anything you can also add on extra like a bar fridge (yes it fits with plenty of room to spare inside the Lotus Belle tents) tea and coffee and a kettle, an esky, dishes and washing up supplies, cutlery and everything you need for one fine picnic. And if you have a group or a special event coming up, Happy Glamper can also organise to set up multiple tents on a private property or venue site. It’s a quirky and memorable way to celebrate a special event. 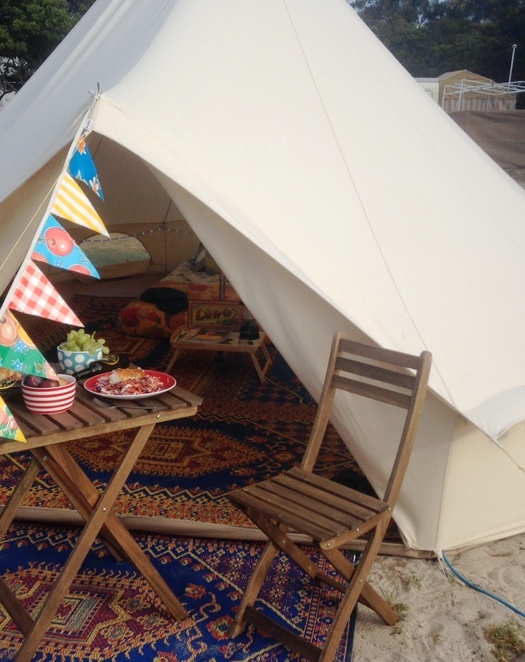 For more information on the camp sites where you can set up your next glamping adventure, visit Happy Glamper website.